Ayrshire based Hotel and Restaurant group have recently announced the appointment of Kevin McGillivray as Food operations Manager. Kevin is a renowned chef in his own right and recently joined the family-owned SimpsInns group as the new Food Operations Manager after his most recent position as Executive Chef at the Marine Hotel in Troon. 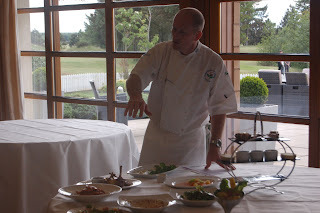 Kevin brings a wealth of experience to the role and is currently President of the Federation of Chefs Scotland. He is also a former Scottish Chef of the Year and winner of the prestigious Flavour of Scotland. His illustrious list of achievements also includes Scottish Hotel Chef of the Year. Kevin is seen on the right explaining some new dishes to the Gailes Restaurant team. The position of Food Operations Manager is a newly created role within SimpsInns and is due to the continued expansion and success of the company. This year the vibrant Si! :Café:Bar:Restaurant will open on the Kilwinning Road in Irvine, while the company recently took ownership of The Riverside Inn just south of Ayr. The innovative Si! Shack concept – to provide a new food offering in the private garden and covered veranda area - at the Waterside is also due to open in the coming months. “One of the big reasons for taking on this new role with SimpsInns was the enthusiasm and passion for food within the company,” explained Kevin at a recent food tasting experience with staff members at the Gailes.